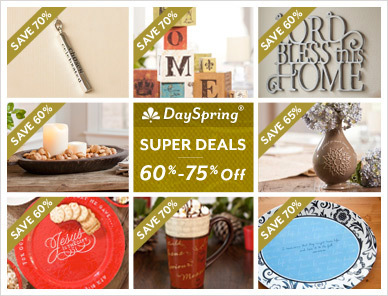 In case you missed it, DaySpring’s Black Friday Super Sale is going on now and ends today. They have 24 “super special” items marked 65-75% off. You can also get 30% off anything else on the site with the code 30SUPER . Plus, get free shipping on all orders over $50. However, some of the best deals though can be found when you shop the clearance items and add the 30% off coupon to it. Next article: Lisa Leonard Sale Extended – Ends Today! I just received my order and I am SO HAPPY with everything! I ordered two vases, two platters, and three jute bags for a total of about $55 (and free shipping) and LOVE all of them! Everything is larger and sturdier than I imagined, and I can’t wait to give these as gifts, plus the two trivets I got last year after the holidays. And, I had forgotten about buying their nativity set last year after Christmas and we have it out and love it! I’m so glad you are pleased with everything. They really make beautiful products.